What are watched tags and ignored tags? How do they work? On Stack Overflow, the content of the main page question list appears to be influenced by watched and ignored tags. How does that work? For more information, see "How do I find topics I'm interested in?" in the Help Center. Watched Tags: Questions with these tags become highlighted, formerly known as "interesting tags" and "favorite tags". The ignored tags list takes precedence over the watched tags list. This means that if a question has a tag that is in your ignored tags list it will be treated as ignored, regardless of whether or not it also contains a tag that is in your watched tags list. On Stack Overflow, these preferences affect how questions are displayed on the home ("Recent questions") page and the various questions pages. See also: Expressing Your Tag Preferences. Not the answer you're looking for? Browse other questions tagged support tags faq-proposed tag-watching . 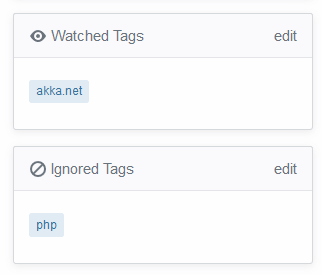 What is the use of Watched Tags in Stack Overflow? Why do some posts seem faded out suddenly? Why are some questions on the homepage beige? Is it possible to ignore tags that are related to each other? How do I write a good tag wiki? Is it okay to use/copy content published elsewhere?